BEDFORD, MA -- The East Coast Wizards put the Christmas break to good use. The Wizards have not slowed down since. With Pitser leading the offense and a recently replenished defense shutting down opponents, East Coast is 6-0-0 since the holidays, outscoring opponents 36-9 in the process. The Wizards are 21-9-1 overall and second in the Eastern Hockey League South Division after winning both games in the league’s final showcase of the season in their most recent outings. “It’s a combination of some guys coming back off injuries, but also adding a few guys on the back end has really solidified our team,” Wizards coach and general manager Freddy Meyer said. The return of two defensemen has played a big role. Mike Bermingham and Josh Loveridge played games for East Coast last year. Bermingham rejoined the team for the most recent 12 games, and Loveridge came back two games later. “Both know the system from last year,” Meyer said. Pitser, who played with them last year, has had six-point and four-goal games during the streak. “They definitely helped us out a ton on our back end,” Pitser said. 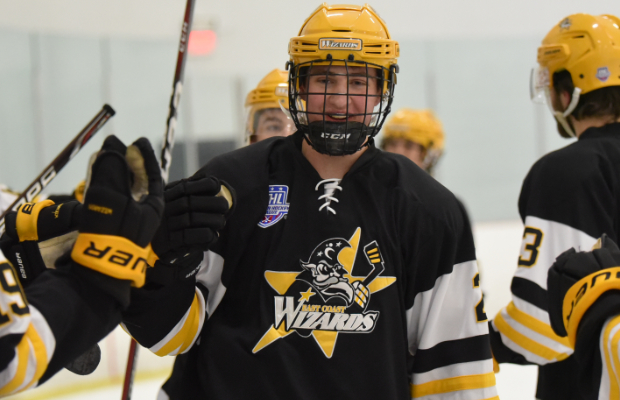 Another boost has come from forward Brendan Darby, who has 21 points in 14 games with the team, including five assists in the 7-1 win over Team Maryland to complete the sweep of the showcase games in Walpole, Mass. “He was just passing me pucks in the slot,” Pitser said. “I would pretty much get one-touch passes from him and I was able to one-time them. Pitser turned two of the rushes into goals on shots high to the blocker side. In the first game of the showcase, a 5-1 win over the North Carolina Golden Bears, Pitser scored a power-play goal. Pitser had 14 goals and 22 assists in 48 games last season and decided to return. He credits Meyer for helping him become more productive in his second season. Pitser found a place to play with East Coast, while Meyer found a leader for a forward group that he said has featured the best depth in the program’s five years on the junior level. “He’s put a lot of time and work in during the 12-plus months he’s been here as a Wizard,” Meyer said. “He’s having a great year so far. Brendan Darby ('99) joined the Wizards in late November, and has tallied 21 points in his first 14 games in the EHL.